Jupiter transit to Libra 2017 prediction for Leo Sign - Guru peyarchi palangal 2017 for Simha Rasi as per Thirukanitha Panchangam. Let us analyze Guru Peyarchi 2017 prediction in detail for Simha Rasi, so we can know what to expect. Leo is the 5th house in the Zodiac Sign. The stars Magha Nakshatra, Pooram nakshatra and Uthiram (1st pada) are under this constellation. Those born under any of these stars will have Leo as their moon sign. Lord Jupiter is the ruler of your 5th and 8th Houses. He is a part-benevolent, part-malevolent ruler. Last year, Lord Jupiter transited to your friendly House, the House of Virgo on August 2, 2016. Last year, students were able to excel in their academics. Those working as professionals or in businesses saw their career zoom ahead with promotions and salary hikes. People awaiting marriage or childbirth had their wishes fulfilled. Your expenditure lessened and your income rose. Your family had many occasions to celebrate. Last year was a good year for you. Let us have a look at what this transition of Lord Jupiter brings for you. Lord Jupiter will transit from the House of Virgo to the House of Libra on September 2, 2017, and stays there until October 4, 2018. The transit of Lord Jupiter brings you a mixture of both good and bad occurrences for you. As the planet Jupiter transits to your 3rd House, it will not bring a very good outcome for you. But, the effects will not be very severe. This is because, the 3rd House is a shadow House, hence, the placement of Lord Jupiter there will not effect good outcomes for you. But, in Lord Jupiter’s case, Jupiter aspects have much more effect than His placement. From Libra, Jupiter aspects your 7th, 9th, and 11 houses. Lord Jupiter aspects your 7th House (House of Aquarius) which is called Kalathra Sthanam. The 7th House deals with marriage, husband-wife relationship. If some of you are awaiting your marriage, then this year will be fruitful for your dreams. Similarly, marital relationships will be quite good. You will gain due to your spouse. 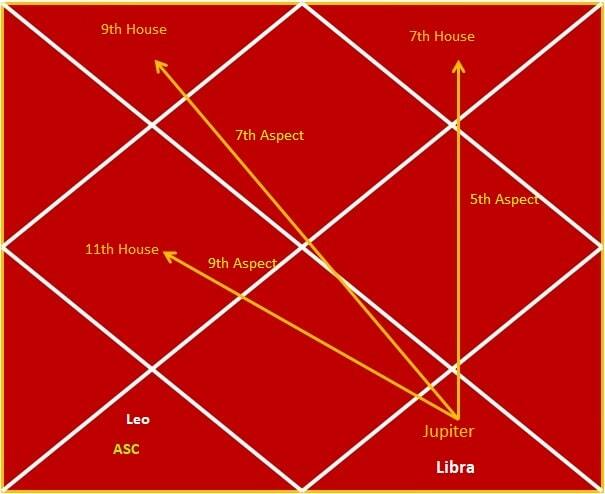 Planet Jupiter aspects your 9th House (House of Aries) which is called Bhakya Sthanam. This brings special results for you.The 9th House deals with dharma and your paternal relationships. Your father’s health will improve. He will be supportive of you. You will gain properties from your paternal side. Your interest in charity and social work will increase. You will undertake many pilgrimages. Also, Lord Jupiter aspects your 11th House (House of Gemini) which is called Labha Sthanam. The 11th House deals with elder siblings. Your elder sister and brothers will have a good year, with promotions, marriages, childbirths and excelling in other fields of life. Students will have a rocky year ahead with both high and low scores in academics, causing anxiety. People in business will face stagnation. Many obstacles will come in the way of promotion and salary hike. There will be hindrances when you start a new business, but it will be finally profitable. Money flow will be good. Any outstanding loans will be repaid back to you. Generally, this transit brings better prospects for your spouse. Your elder siblings will have a good year, with promotions, good business prospects, children and such.